Design...The ultimate frontier crossed by the mind as it materializes abstract thoughts, desires and passions into the visual realm. Our entire daily existence bathes in design. From the shape of leaves on a tree to the ripples on the face of a water puddle, native designs are omnipresent in our surroundings. (Wo)Man-made designs are however a whole different ball game. We idolize people who can convert thought into shape and stand in awe in front of their skill, and rightfully so. Just imagine Apple products without the design hype that comes with them or a slick Audi being reduced to a metal box and four wheels. The Web is no different in this aspect. Things have come a long way from the very first hypertext markup lines ever written on a screen, . The Web has moved on from being a geekspace to become a commodity, and like any commodity it requires refining and packaging to better sell its contents. It was out of this shift in paradigm that a new breed of intrepid warriors emerged: Wielding nothing but a 21" Macbook and a 5 button mouse, the valiant warrior broke through the multitude of lines of code that programmers had erected to keep the average Joe (and Jane) clueless and afraid from the wwworld behind the screen. With great responsibility also came great show off. Over-interpreting every splash of color and setting the value for a day's work well beyond the entire budget of the project were a necessary evil intended to make the barbaric hordes of non-designers understand how big was the favor they were receiving by getting a web designer to accept their project. 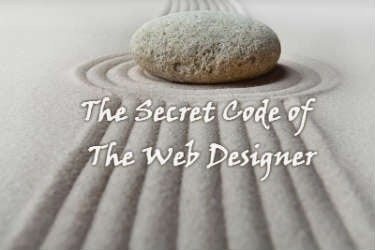 But there is also order in the chaos; Much like the ancient Samurai, Web Designers live by a set of rules only known to them. The Code of the Web Designer is only passed from one generation to another in a secret ceremony shrouded by mystery, Pringles, scarves, Nutella and chants in old Elvish languages that consist mostly of rants on how web developers make their lives so miserable and really, really " just don't get it". The Web is what you see in the browser. There is no relation between a website's layout and its HTML code. Web Designers do not slice any of their designs, because they do not know HTML. What are the web developers doing anyway? Web Designers think that CSS stands for Cute, Sweet & Simple. Web Designers do not consult with web developers before suggesting page animations or interactive features. If they can imagine it, then the developer should be able to find a way to do it. Web Designers can only produce one viable, acceptable layout worth implementing per client. Any additional layout that the Web Designer is forced to create for that same client, will be as ugly, hideous and repelling as possible, in a way to make the original design seem like a Da Vinci masterpiece. Web Designers address design and functionality related bugs and mistakes with: "The developers did not execute it the way I asked them to"
Web Designers charge based on the Sting Fiscal System. The Sting fiscal system is based on Sting's mega hit "Every Breath You Take". Web Designers payment terms are usually 50% down payment upon commissioning the project and 50% before the client approves the final design. However, luckily for us, not everybody lives by the code. The Ronins of the Web Designer tribes still offer consolation and hope, mostly by not having an attitude and then some more by simply learning the craft which they choose to be associated with and then doing it well. Alas much like the Ronins, these web designers never stay in one place for too long and often move on where they can do what they like away from all the hype. Below is a recently discovered haiku describing the web designer...cherish it!